Our schedule of tough August fixtures continues again today when we take on Liverpool in the lunchtime kick off. I, like many of you, hate kick-offs before 3pm. The atmosphere in the ground is normally flat and the football doesn't really normally get going until the second half. Hopefully though, today will be different because Liverpool are the visitors and it's a match we'll desperately want to win. The crowd will be behind the team like they were on Tuesday night and we can be positive about our chances, no matter who is in the team today. Arsene Wenger has prepared the ground for Samir Nasri to play some part in the game today by announcing the Frenchman has been included in his 18-man squad. It shouldn't really come as a shock. Nicklas Bendtner sat on the bench on Tuesday night, why can't Nasri do the same? However this time I expect we'll see Nasri start the match because we really don't have any option other than to play him. It's him or another 17-year-old who's yet to start a Premier League game. We don't have to sing his song or be happy about having him involved but he is still an Arsenal player and have to use him whilst we're still paying him. "I am focused on winning the game and, when I pick my team, I don't think if he might leave the next day or the next week. It doesn't mean anything to me. Nasri is in the squad. If I decide to play him, he will play. "When you are professional you play until the last day. Everywhere I have worked in my life I have made sure that, up until the last second of where I was, I did the job properly." And whilst Wenger has spoken passionately about Nasri's commitment to the club, the player himself hasn't shown the same commitment the fans want from a player they've invested so much time and effort in supporting. However we have to put our own feelings to one side about the Frenchman and think about the good of Arsenal as a whole. We can't play Liverpool with Aaron Ramsey, Emmanuel Frimpong and Henri Lansbury in midfield when one of those could make way for an experienced player like Nasri. Fitness, suspensions and our inactivity in the transfer market have caused us to be in the position when we are forced to pick a player we really don't want to and who's about to leave for Manchester City. I will not sing his name. I will not sign the other song. I will not celebrate him scoring but I will support the team. They need us. We have our backs against the walls and like no other time before have they needed us more than they do now. We need to support this Arsenal team 100% and not pay any attention to a Frenchman who won't be at the club next week. Don't give him the pleasure of thinking he's got under our skin. The Arsenal is more important than he is. 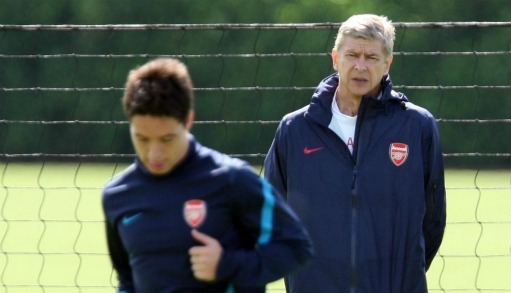 The team is now also without Tomas Rosicky who won't be played after picking up a knock in midweek. We're down also Alex Song and Gervinho (suspended), Abou Diaby, Jack Wilshere, Johan Djourou, Armand Traore and Kieran Gibbs (injured). It's going to be interesting to see who the manager picks in his starting 11. However the one thing I'm pretty certain of is that Nasri will be one of the 11. I'll preview the team and betting closer later this morning. The manger has spoken glowingly about Robin van Persie who will lead the team out later for the first time in his new role as Club Captain. "Robin van Persie loves the club. He's attached to the club. He's a technical leader on the football pitch. "Robin van Persie speaks his mind with everybody but without bad feelings. I think that's an interesting quality and he's one of the players who can lead this group. "He will be more vocal than Cesc. They are different personalities. "The only bad thing about Robin in the last few seasons is that he has been injured. "Hopefully, he looks more settled now and, if he can have a strong season with no injuries, he will be the perfect leader. I am convinced about that. He is world-class." I'm really pleased Robin is captain and I hope that he can continue with his good spell of fitness which will show how important he can be to this club. We certainly need him now more than ever, especially in front of goal where other players have seen their form dry up. He could be crucial to our season. Former vice chairman David Dein has stepped out to back Arsene Wenger, his second appearance on the BBC within the last couple of weeks. Dein said Wenger could walk away, a suggestion the manager later rubbished at his press conference. I do wonder why Dein has stepped up his media profile in the last month. Obviously one of the reasons is to support his friend and perhaps as a person many fans have great respect for he'd get a better reception than say Peter Hill-Wood would get by saying the things he has. He's also filling a void left by majority shareholder Stan Kroenke, who has yet to formally introduce himself to fans. I imagine all will come clear in time. A couple of transfer rumours. The Daily Mail say Henri Lansbury is a target of Swansea. Also in the Mail is news that Werder Bremen want £8.7m for Per Mertesacker. As I said earlier in the week, I'm convinced we won't do any business until Thursday at the earliest, once we know we are in the Group Stages of the Champions League or not. I'll post my team and betting preview a bit later. If you're not able to get to the game and would like to follow what's going on at the match, join us for our live blog from about 12.30pm. I'll be providing live updates from the Grove. You can set yourself up a reminder below.